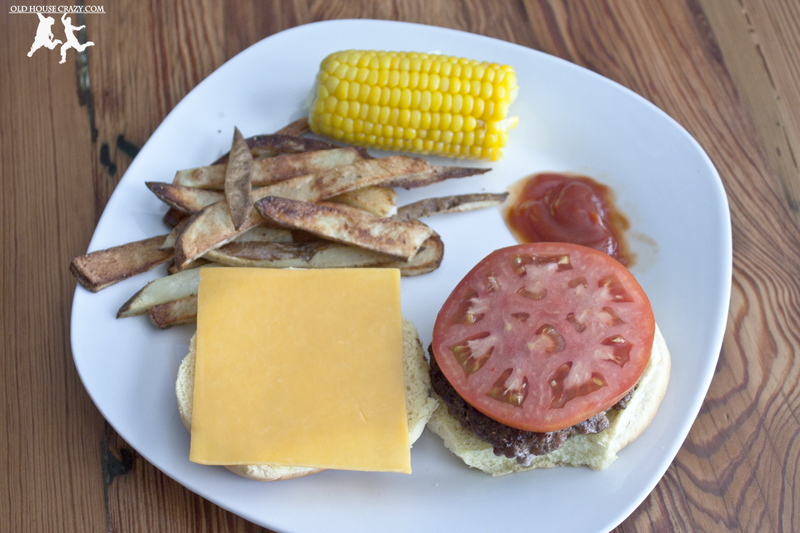 Hamburgers and French Fries make up the classic All-American meal. I’ve had countless burgers during my lifetime, as I’m sure most of you have as well. Do you like to cook your own at home? That’s something I’ve enjoyed for years, and as I’ve developed as a home chef, I’ve been through many phases of burger cookery. There was the “meatloaf burger” phase where I chopped up onions, peppers, cheese, or whatever and mixed it in with the burgers. I had an “other meat” phase where it seemed like every time I made burgers, I tried to include some extra meat. I made shrimp burgers, chorizo burgers, lamb burgers, pork chop burgers, and burgers with mixtures of different ground beef cuts from the grocery store. There have also been a hundred different combinations of spices and exotic seasonings thrown into the burgers, always in the hope of making the “perfect burger”. The perfect burger IS out there. You CAN make it. It’s actually really simple. Ground beef + salt + pepper. That’s it. Nothing more. Throughout the years I’ve been trying to spice up the hamburger and make it fancy, I keep coming back to the fact that a hamburger is best when it’s just a hamburger. What I’ve learned is that it’s not what you put on or in the hamburger, but what the hamburger itself is made of. It’s made of ground beef. Duh. I know that sounds stupid. However, have you thought about ground beef? I have. 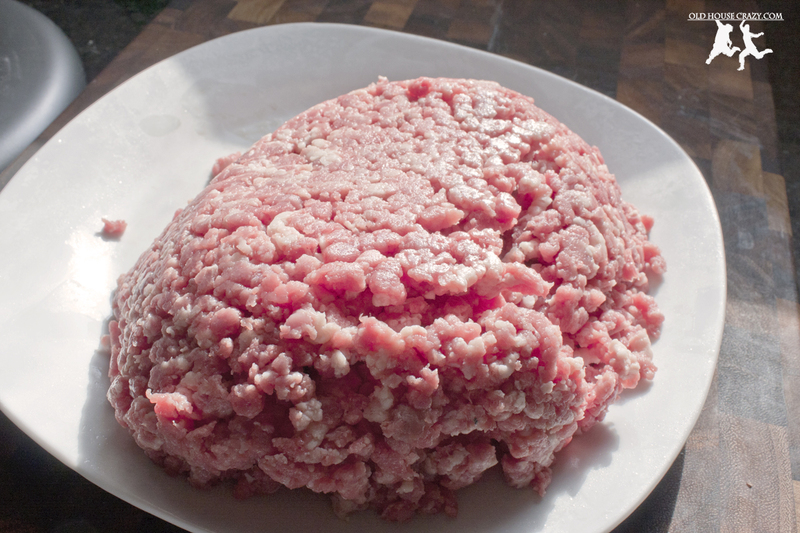 Aside from the recent scares about “Pink Slime”, is there anything else wrong with store-bought ground beef? I think there is. “Freshly Ground Beef” from the grocery store can be a misleading term. Does it mean that the grocery store took whole cuts of meat, ground it, and put it in those little packages for you to purchase? That’s what you think it means. It might also mean that the grocery store received a hundred pound tube of ground beef from Nebraska and ground THAT into little packages for you. They DID grind it, so they CAN say it’s freshly ground. Your pack of meat might contain meat from many cows. If one of those cows was sick, there’s little hope that you could trace it back to the source. Since I don’t work at a grocery store or in the beef industry, I can’t say for sure what the term means. That’s why I grind my own beef. 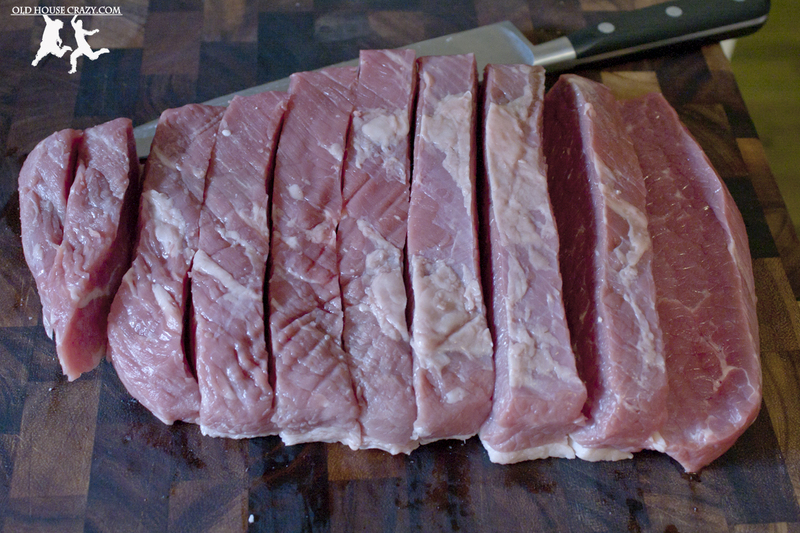 We do our best to buy organic or grass-fed beef cuts for grinding. Chuck Roast/Steak is the common choice since it’s cheapest. However, since we’re running the show, we use other cuts as well, including ribeye, sirloin, and, in the case of this blog post, brisket. Yup, we made burgers out of beef brisket. I’ll get to the actually cookery in a bit. 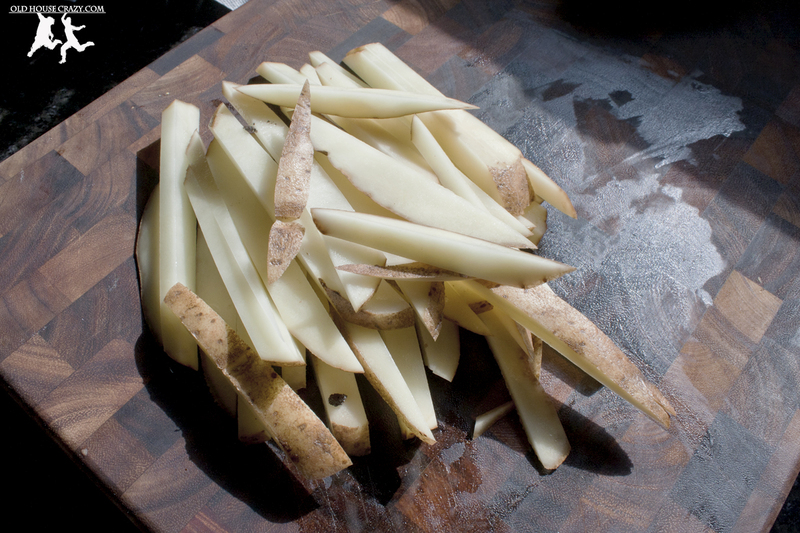 Now let’s talk about potatoes and making your own french fries that aren’t as bad for you as restaurant fries. 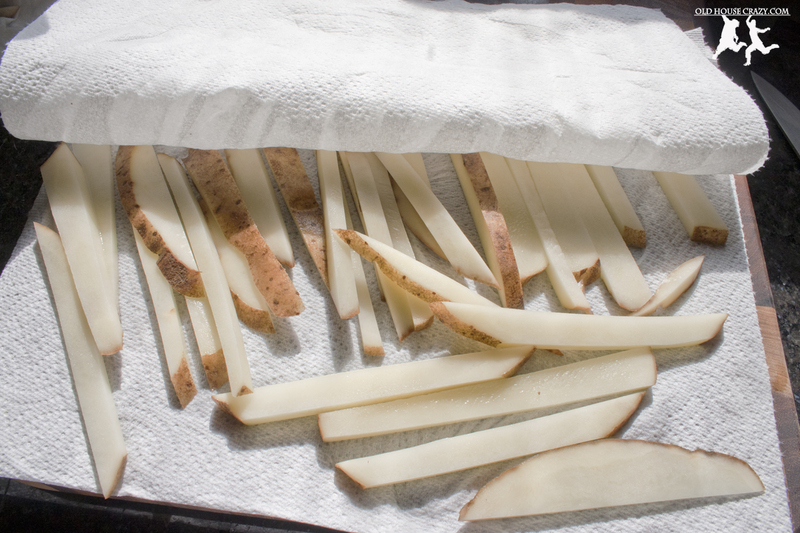 The key to making your own fries at home is cutting the potatoes into slices that are mostly uniform in thickness. They’ve all got to cook in about the same amount of time or you’ll have some that are good and crispy and some that are soft and mushy. That’s bad. 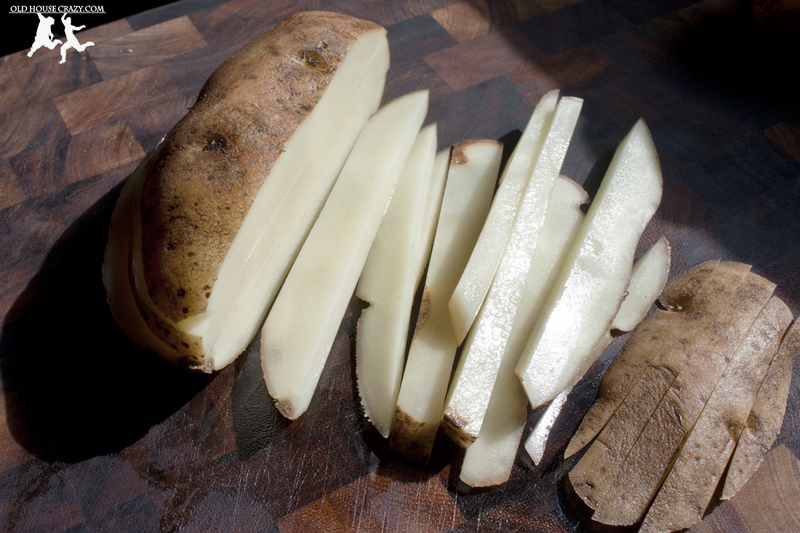 In order to get the potatoes cut evenly, I use a very sharp chef’s knife to cut the potato in half, then into quarters lengthwise. 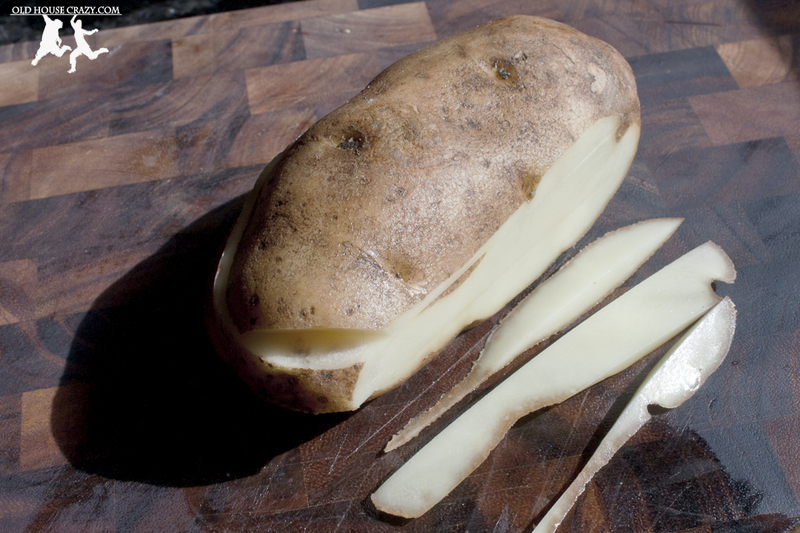 I take a little sliver off the bottom so that the potato will sit flat on the cutting board. Once it’s sitting flat, cut it down it’s length through all of the quarters, about 1/4-1/2 inch from the edge. Each time you do this, you’ll get four fries to fall off. Keep at it until the potato is finished. Next, you’ve got to rinse the fries in water. This is essential to keeping the fries from sticking. 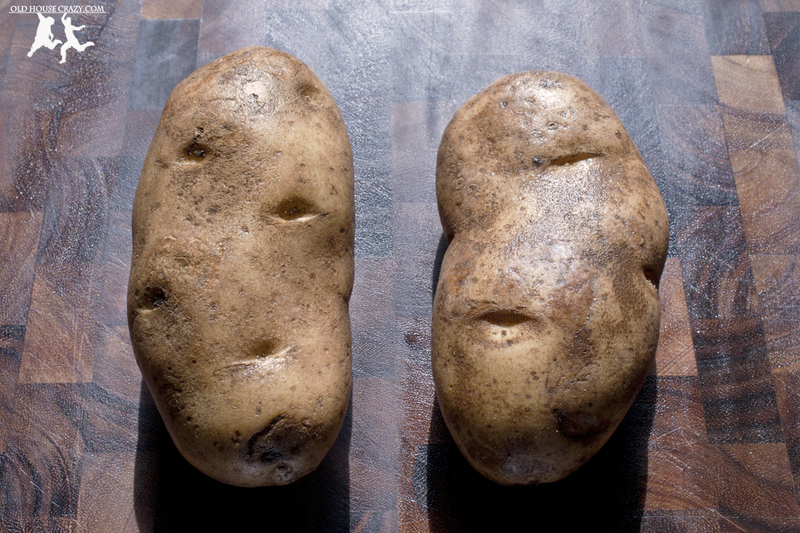 Since potatoes are a way for the plant to store energy in the form of starch, you release starch every time you slice them. 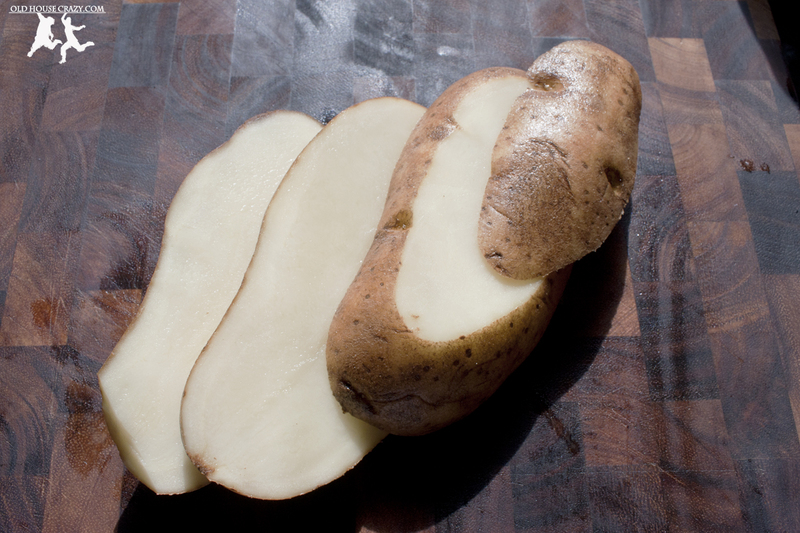 This starch is what makes taters stick together in the frier or in your pan. 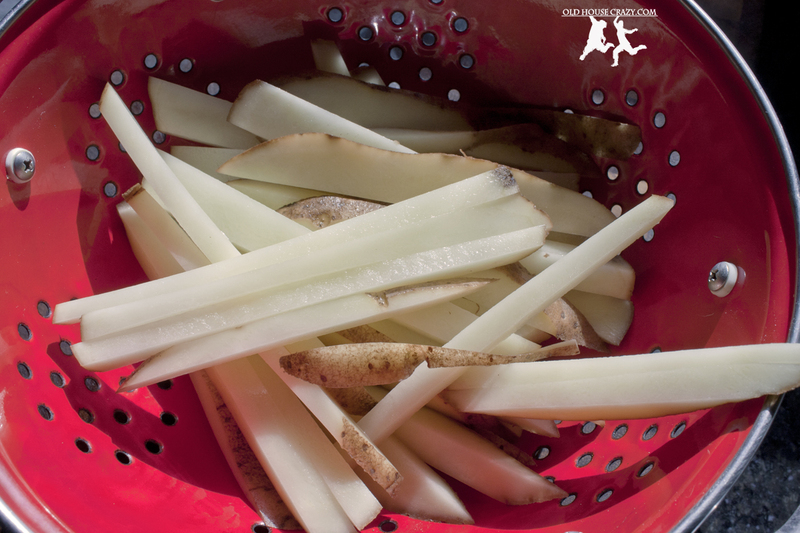 Rinse them off with water and then dry the fries with paper towels. I like to season them with a little sea salt and freshly ground pepper using a gallon baggie. 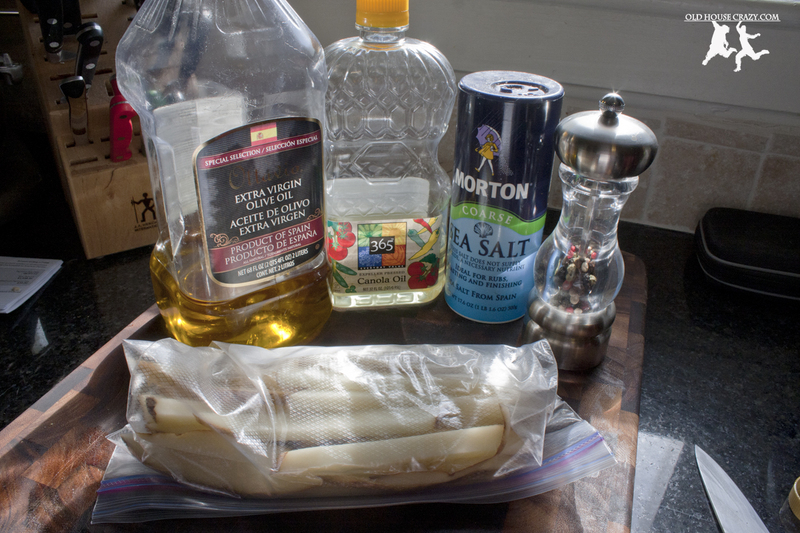 Add in some oil so the seasoning sticks and the fries get crispy in the pan. Once they’re seasoned to your liking, spread them out on a baking sheet lined with aluminum foil and bake for 20-30 minutes at 425 degrees. The time varies based on how thickly you cut the fries. Watch them. When you can smell them without opening the oven door, they’re ready to be flipped. Now for the beef. 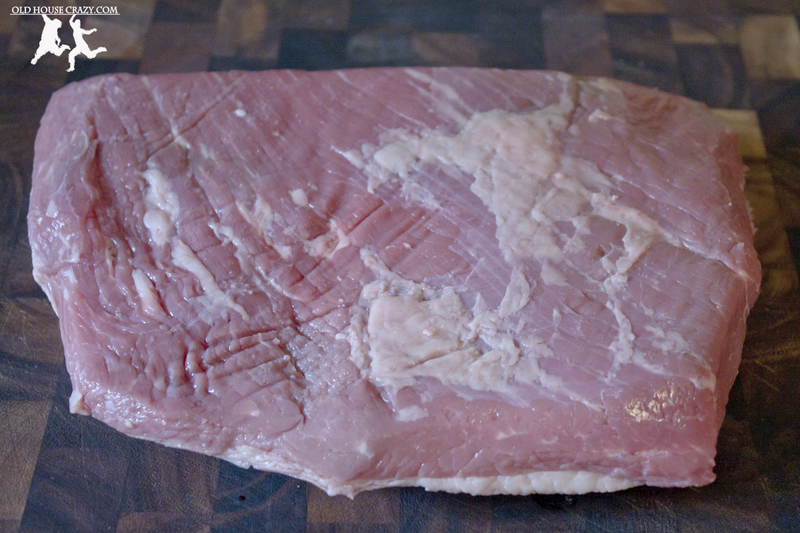 Below, you can see the half brisket I brough home from the store. It’s from a single cow. Now I know my burgers all came from the same animal. It’s not something I should have to think about, but I do. I cut the beef into long slivers and put those on a plate in the freezer for a few minutes while I was cutting the potatoes. Meat that is almost frozen grinds much more smoothly than meat at room temperature. Once the potatoes were in the oven, I pulled out the chilled beef and set up the grinder attachment for our Kitchenaid stand mixer. (Side note – ask for one for your wedding, anniversary, birthday, saturday, whatever. You must own one.) The paper towel is taped to the top of the grinder because the grinder likes to spit blood across the room. This is a side effect of grinding your own meat. The paper towel is how we deal with it. I grind the meat twice. Once with the coarse plate and once with the fine plate. The coarse plate chops the meat and fat, I mix by hand, and then the fine plate gives the beef a really good texture for burges. Some people will only grill their burgers. That’s too bad, because burgers cooked in a frying pan with a little butter and a little oil are truly amazing. Cook on each side until you can see a little juice coming up through the meat. The only seasoning I add is salt and pepper to each side. 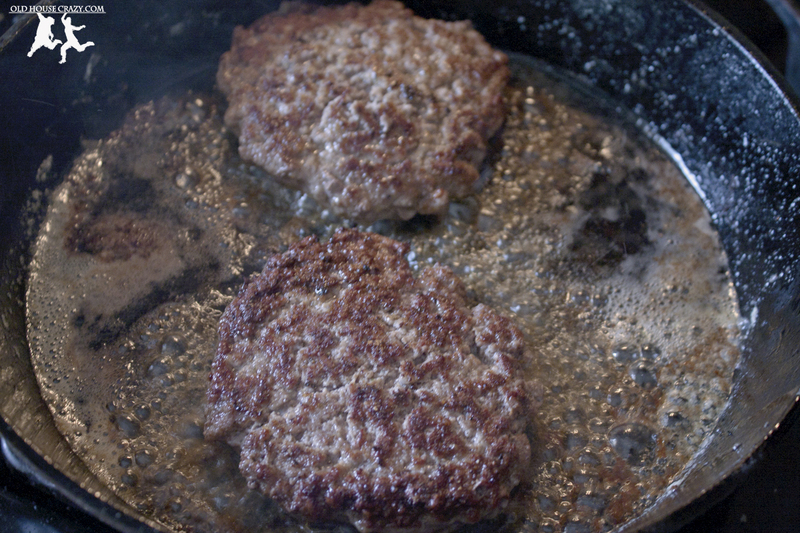 The outside of the patties gets nice and crispy and delicious. This entry was posted in Better than store bought, Dinner, DIY, Food, Mood Boosters, Recipes and tagged Burgers, Delicious, dinner, food, French Fries, Homemade, Make it yourself. Bookmark the permalink. Thanks. I’ve found that most things are best done at home, from food to furniture. Well done! This reminds me of making burgers with you back in the summers of 2003/4/5. I think at that point we were going for the more you can put in the better. I distinctly remember putting in onions, peppers, beer, oatmeal, an egg, black and cayenne pepper, and salt. Keep up the good work. That’s hilarious. Those were such good times. Burger still needs catsup, mayo and mustard! 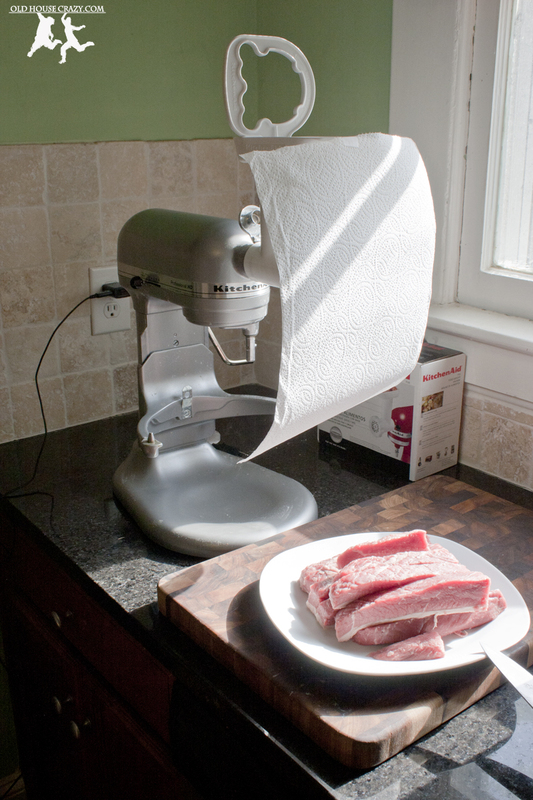 I have the mixer now – Thanks, Ginger – but I don’t have the grinder. I do have Grandma’s, though, but I’ve never ground my own. The grocery store here has good fresh meat, so I’m lucky. I disagree. These brisket burgers were wonderfully juicy and didn’t need any condiments. 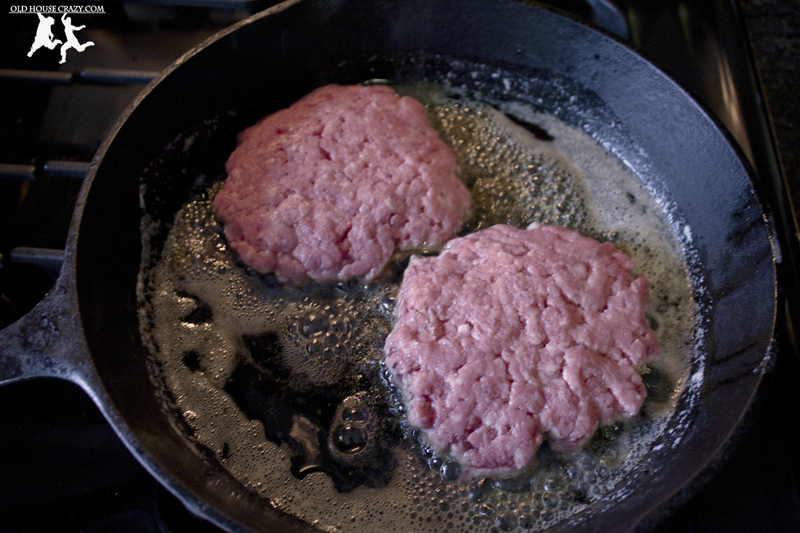 If your burger is juicy and delicious, you don’t need sauce. I really think you should get the grinder attachment and grind your own. Great looking burger. I’ve been on the hunt for the perfect burger blend. I’ve used chuck, short ribs and even skirt steak (don’t bother). I’ve been wanting to try adding in some brisket. Was that a whole packer brisket? Or just the flat? Who much of the fat was trimmed off? It was just the flat. This time, I just picked up a pack of brisket at the grocery store. It would have been useless as BBQ brisket. It was already trimmed and therefore very lean. The burgers were delicious.